America is leaving the Paris Agreement on Climate Change. This is, by scientific consensus, a terrible outcome for the planet. But it is also a disaster for American foreign policy and its role as a global leader. With this decision I’m left scratching my head. What does America stand for? What does it want the world to look like? I can no longer tell you. Here, quick test: Name an issue the US Government is taking a leadership position on in the world. I can think of three. All of which are reactionary, none of which represent of a vision of where we should go. What is easier to tell you is what the US Government — and by this I don’t just mean the president, but also a large number of congresspeople and possible senators—no longer believe is important. Some of these items — women’s rights and climate change for example — have been contentious domestically for some time. But others formed the bedrock of the American vision for the world. Yes, there are lots of examples of American hypocrisy in its foreign policy (this is true of all countries) but trade, the western alliance (grounded in NATO), human rights and democracy served as general foundations for bringing together key stakeholders around the world in a shared vision of what the world should look like. That is now all in tatters. What does America believe in? What is the shared vision around which it will rally allies and unaligned countries? Beats me. Fighting terrorism is important, but it isn’t an organizing principle upon which to build a vision of the future. China is willing to marshal economic and political capital to fight climate change which it is also leveraging to engage India and others. Its One Belt, One Road infrastructure plan is a vision for re-organizing global trade. Its Asian Infrastructure Investment Bank offers an alternative to the World Bank(which it is unclear the current administration even cares about) as a way to fund development and growth. There is a lot about China’s vision for the world that is unclear and frankly, I’m not comfortable with. It is not hard to imagine a mercantilists’ world where human rights are non-existent. But it at least conveys a vision of shared prosperity, and it has a vision that tries to tackle global shared problems like climate change that require leadership. And this rot in US leadership is not about Trump. What is clear is that Congresspeople and Senators appear happy to trade American leadership and vision for domestic wins such as repealing the Affordable Care Act and rolling back taxes. When Chancellor Merkel of Germany says the United States can no longer be relied upon, she wasn’t just talking about the president. This isn’t to say the alternatives are much better, but those looking for vision and leadership need to hope America wakes from its sleep walk, get very creative in finding partners, or start picking between relatively unpalatable options. But hoping others change has not been a sound basis for foreign policy in the past, and so I doubt the world will wait long. This entry was posted in canadian foreign policy, commentary, united states and tagged climate change, foreign policy, International-Relations on May 31, 2017 by David Eaves. Last weekend at FooCamp, I co-hosted a session titled “The End of the World: Will the Internet Destroy the State, or Will the State Destroy the Internet?” What follows are the ideas I opened with during my intro to the session and some additional thoughts I’ve had and that others shared during the conversation. To avoid some confusion, I’d also like to clarify a) I don’t claim that these questions have never been raised before, I mostly hope that this framing can generate useful thought and debate; and b) that I don’t believe these are the only two or three possible outcomes; it was just a interesting way of framing some poles so as to generate good conversation. A while back, I thought I saw a tweet from Evgeny Morozov that said something to the effect: “You don’t just go from printing press to Renaissance to iPad; there are revolutions and wars in between you can’t ignore.” Since I can’t find the tweet, maybe he didn’t say it or I imagined it… but it sparked a line of thinking. Most often, when people think of the printing press, they think of its impact on the Catholic Church – about how it enabled Martin Luther’s complaints to go viral and how the localization of the Bible cut out the need of the middle man the priest to connect and engage with God. But if the printing press undermined the Catholic Church, it had the opposite impact on the state. To be fair, heads of state took a beating (see French Revolution et al. ), but the state itself was nimbler and made good use of the technology. Indeed, it is worth noting that the modern notion of the nation state was not conceivable without the printing press. The press transformed the state – scaling up its capacity to demand control over loyalty from citizens and mobilize resources which, in turn, had an impact on how states related (and fought) with one another. In his seminal book Imagined Communities , Benedict Anderson outlined how the printing press allowed the state to standardize language and history. In other words, someone growing up in Marseilles 100 years before the printing press probably had a very different sense of history and spoke a markedly different dialect of French than someone living in Paris during the same period. But the printing press (and more specifically, those who controlled it) allowed a dominant discourse to emerge (in this case, likely the Parisian one). Think standardized dictionaries, school textbooks and curricula, to say nothing of history and entertainment. This caused people who might never have met to share a common imagined history, language and discourse. Do not underestimate the impact this had on people’s identity. As this wonderful quote from the book states: “Ultimately it is this fraternity that makes it possible, over the past two centuries, for so many millions of people, not so much to kill, as willingly to die for such limited imaginings.” In other words, states could now fully dispense with feudal middle managers and harness the power of larger swaths of population directly – a population that might never actually meet, but could nonetheless feel connected to one another. The printing press thus helped create the modern nation state by providing a form of tribalism at scale: what we now call nationalism. This was, in turn, an important ingredient for the wars that dominated the late 19th and early 20th century – think World War I and World War II. This isn’t to say without the printing press, you don’t get war – we know that isn’t true – but the type of total war between 20th century nation states does have a direct line to the printing press. So yes, the techno-utopian world of: printing press -> Renaissance -> iPad is not particularly accurate. What you do get is: printing press -> Renaissance -> state evolution -> destabilization of international order -> significant bloodshed -> re-stabilization of international system -> iPad. I raise all this because if this is the impact the printing press had on the state, it begs a new question: What will be the impact of the internet on the state? Will the internet be a technology the state can harness to extract more loyalty from its citizens… or will the internet destroy the imagined communities that make the state possible, replaced by a more nimble, disruptive organization better able to survive the internet era? Note: again, these scenarios aren’t absolutes or the only possibilities, they are designed to raise questions and provoke thinking. One possibility is that the state is as adaptive as capitalism. I’m always amazed at how capitalism has evolved over the centuries. From mercantilism to free market to social market to state capitalism, as a meme it readily adapts to new environments. One possibility is that the state is the same – sufficiently flexible to adapt to new conditions. Consequently, one can imagine that the state grabs sufficient control of the internet to turn it into a tool that at best enhances – and at worst, doesn’t threaten – citizens’ connection to it. Iran, with its attempt to build a state-managed internal network that will allow it to closely monitor its citizens’ every move, is a scary example of the former. China – with its great firewall – may be an example of the latter. But one not need pick on non-western states. And a networked world will provide states – especially democratic ones – with lots of reasons to seize greater control of their citizens’ lives. From organized crime, to terrorism, to identity theft, governments find lots of reasons to monitor their citizens. This is to say nothing of advanced persistent threats which create a state of continual online warfare – or sort of modern day phoney phishy war – between China, the United States, Iran and others. This may be the ultimate justification. Indeed, as a result of these threats, the United States already has an extensive system for using the internet to monitor its own citizens and even my own country – Canada – tried to pass a law last year to significantly ramp up the monitoring of citizens online. The UK, of course, has just proposed a law whose monitoring provisions would make any authoritarian government squeal with glee. And just last week we found out that the UK government is preparing to cut a blank check for internet service providers to pay for installing the monitoring systems to record what its citizens do online. Have no doubts, this is about the state trying to ensure the internet serves – or at least doesn’t threaten – its interests. This is sadly, the easiest future to imagine since it conforms with the world we already know – one where states are ascendant. However, this future represents, in many ways, a linear projection of the future – and our world, especially our networked world, rarely behaves in a linear fashion. So we should be careful about confusing familiarity with probability. Another possibility is that the internet undermines our connection with the state. Online we become increasingly engaged with epistemic communities – be it social, like someone’s World of Warcraft guild, or professional, such as an association with a scientific community. Meanwhile, in the physical world, local communities – possibly at the regional level – become ascendant. In both cases, regulations and rules created by the state feel increasingly like an impediment to conducting our day to day lives, commerce and broader goals. Frustration flares, and increasingly someone in Florida feels less and less connection with someone in Washington state – and the common sense of identity, the imagined community, created by the state begins to erode. This is, of course, hard for many people to imagine – especially Americans. But for many people in the world – including Canadians – the unity of the state is not a carefree assumption. There have been three referenda on breaking up Canada in my lifetime. More to the point, this process probably wouldn’t start in places where the state is strongest (such as in North America); rather, it would start in places where it is weakest. Think Somalia, Egypt (at the moment) or Belgium (which has basically functioned for two years without a government and no one seemed to really notice). Maybe this isn’t a world with no state – but lots of little states (which I think breaks with our mold of what we imagine the state to be to a certain degree) or maybe some new organizing mechanism, one which leverages local community identities, but can co-exist with a network of diffused but important transnational identities. Or maybe the organizing unit gets bigger, so that greater resources can be called upon to manage ne,w network-based threats. I, like most people find this world harder to imagine. This is because so many of our assumptions suddenly disappear. If not the state, then what? Who or what protects and manages the internet infrastructure? What about other types of threats – corporate interests, organized and cyber-crime, etc.? This is true paradigm-shifting stuff (apologies for use of the word,) and frankly, I still find myself too stuck in my Newtonian world and the rules make it hard to imagine or even know what quantum mechanics will be like. Again, I want to separate imagining the future with its probability. The two are not always connected, and this is why thinking about this future, as uncomfortable and alienating as it may be, is probably an important exercise. One of the big assumptions I often find about people who write/talk about the internet is that it almost always assumes that the individual is the fundamental unit of analysis. There are good reasons for this – using social media, an individual’s capacity to be disruptive has generally increased. And, as Clay Shirky has outlined, the need for coordinating institutions and managers has greatly diminished. Indeed, Shirky’s blog post on the collapse of complex business models is (in addition to being a wonderful piece) a fantastic description of how a disruptive technology can undermine the capacity of larger complex players in a system and benefit smaller, simpler stakeholders. Of course, the smaller stakeholder in our system may not be the individual – it may be an actor that is smaller, nimbler than the state, that can foster an imagined community, and can adopt various forms of marshaling resources for self-organization to hierarchical management. Maybe it is the corporation. During the conversation at FooCamp, Tim O’Reilly pressed this point with great effect. It could be that the corporation is actually the entity best positioned to adapt to the internet age. Small enough to leverage networks, big enough to generate a community that is actually loyal and engaged. Indeed, it is easy to imagine a feedback loop that accelerates the ascendance of the corporation. If our imagined communities of nation states cannot withstand a world of multiple narratives and so become weaker, corporations would benefit not just from a greater capacity to adapt, but the great counterbalance to their power – state regulation and borders – might simultaneously erode. A world where more and more power – through information, money and human capital – gets concentrated in corporations is not hard to imagine. Indeed there are many who believe this is already our world. Of course, if the places (generally government bodies) where corporate conflicts – particularly those across sectors – cannot be mediated peacefully then corporations may turn much more aggressive. The need to be bigger, to marshal more resources, to have a security division to defend corporate interests, could lead to a growth in corporations as entities we barely imagine today. It’s a scary future, but not one that hasn’t been imagined several times in SciFi novels, and not one I would put beyond the realm of imagination. The larger point of all this is that new technologies do change the way we imagine our communities. A second and third order impact of the printing press was its critical role in creating the modern nation-state. The bigger question is, what will be the second and third order impacts of the internet – on our communities (real and imagined), our identity and where power gets concentrated? As different as the outcomes above are, they share one important thing in common. None represent the status quo. In each case, the nature of the state, and its relationship with citizens, shifts. Consequently, I find it hard to imagine a future where the internet does not continue to put a real strain on how we organize ourselves, and in turn the systems we have built to manage this organization. Consequently, it is not hard to imagine that as more and more of those institutions – including potentially the state itself – come under strain, it could very likely push systems – like the international state system – that are presently stable into a place of instability. It is worth noting that after the printing press, one of the first real nation states – France – wreaked havoc on Europe for almost a half century, using its enhanced resources to conquer pretty much everyone in its path. While I am fascinated by technology and believe it can be harnessed to do good, I like to think that I am not – as Evgeny labels them – a techno-utopian. We need to remember that, looking back on our history, the second and third order effects of some technologies can be highly destabilizing, which carries with it real risks of generating significant bloodshed and conflict. Hence the title of this blog post and the FooCamp session: The End of the World. This is not a call for a renewed Luddite manifesto. Quite the opposite – we are on a treadmill we cannot get off. Our technologies have improved our lives, but they also create new problems that, very often social innovations and other technologies will be needed to solve. Rather, I want to raise this because I believe it to be important that still more people – particularly those in the valley and other technology hubs (and not just military strategists) – be thinking critically about what the potential second and third order effects of the internet, the web and the tools they are creating, so that they can contribute to the thinking around potential technological, social and institutional responses that could hopefully mitigate against the worst outcomes. I hope this helps prompt further thinking and discussion. This entry was posted in public policy, technology and tagged gov20, government, International-Relations, internet, policy, technology, web on June 18, 2012 by David Eaves. Those who’ve been reading my blog for a long time may remember one of my more popular posts comparing the Firefox 3 Pledge Map (locations of downloads of Firefox 3 back in June 2008) versus Thomas Barnett’s Map (published in The Pentagon’s New Map – his blog here). 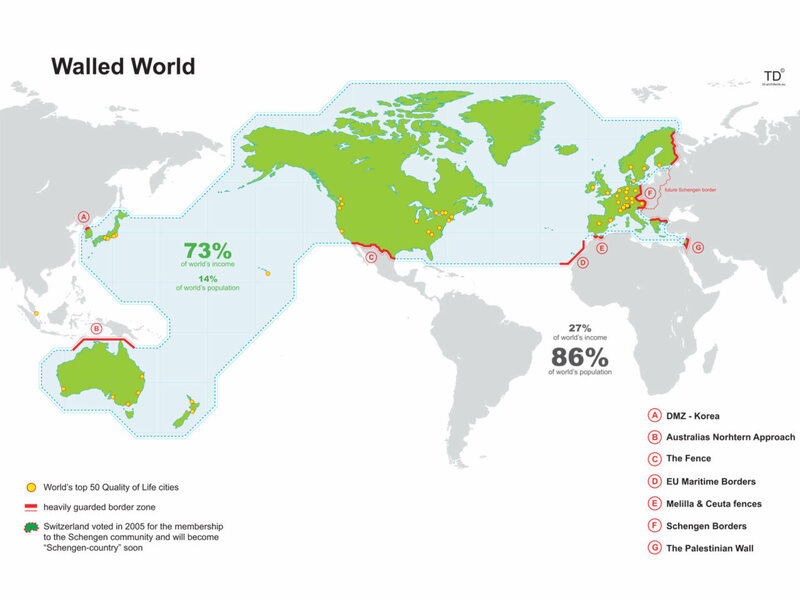 A little while back a friend shared with me a new map, called The Walled World, that she’d found over at The Raw Feed (a great site, BTW) which offers a similar perspective… but with clearly delineated walls that show who is being kept out of which parts of the world. All three maps continue reasonate with me. The first offers us a stategic overlay. Which countries are powers/maintainers of the international system – which places are seeking to radical alter it, or cannot seem to become part of the core. The second shows the virtual implications of that gap. Here, the gap between core and periphery is made starkly clear in technology use. The final shows the physical manifestation of the gap. A stark reminder of the fences we build and the enormous sums of money and energy poured into keeping certain people out. As a final note, I do think the third map is slightly misleading. As disturbing as it is, it is actually far, far too flattering to many traditional western powers as it continues to place them at the “centre.” In a world where the United States appears to be in decline this type of map makes China, Brazil, India and Russia (and even South Africa) look like non entities. Nothing could be further from the truth. This entry was posted in canadian foreign policy and tagged china, firefox, india, International Affairs, International-Relations, map, Pentagon's New Map, Thomas Barnett, united states on February 16, 2010 by David Eaves. The New World Order: Flat, Spiky or Divided? 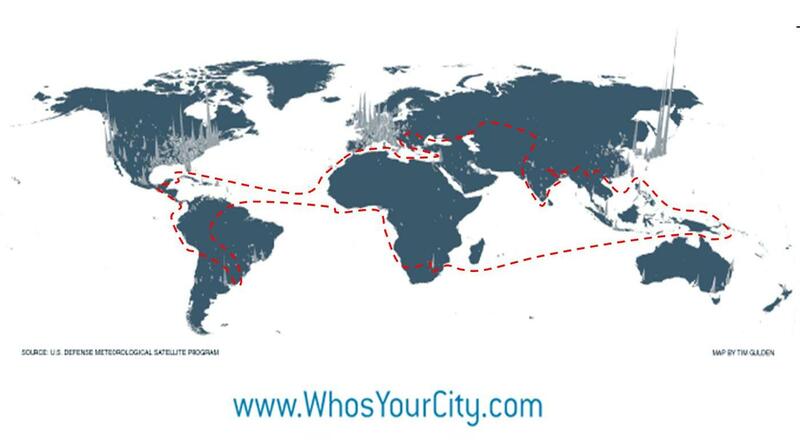 Just started Who’s Your City by Richard Florida out of personal interest but also to better figure out why it is the Vancouver sometimes works, and sometimes really doesn’t work. Figuring out that puzzle, and doing something is part of the reason I joined Vision (and yes, I’m still recovering from the victory celebrations). I’m already sensing a convergence between Florida and some of my other favourite authors – namely Friedman (who Florida references) and Thomas Barnett (author of The Pentagon’s New Map among other books). All three are noticing the same thing, and are even writing along similar veins, but there remain important distinctions, with important policy implications. Flat: Friedman (whom I’m least familiar with) says the world is flat, that innovation, industry, commerce, etc… can now happen anywhere, so we have to prepare for a flat world. Here, I’d argue the core unit of analysis is the individual. We are all free agents, able to do anything or be anything, so we’re going increasingly going to start doing it anywhere. Yes, Friedman believes that governments and industry have massively important roles, but he ultimately sees a world where any place can become a place where people can prosper. If they agitate for it and build it. Spiky: Florida’s analysis is that world is quite spiky, dominated by a set of mega-regions and super-cities where the bulk of the economic activity and culture is produced. 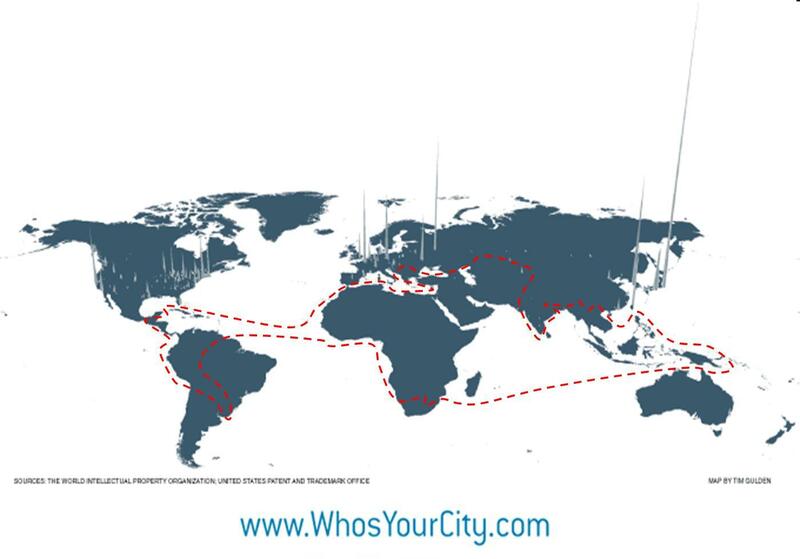 These hubs are connected to one another and largely uncaring of the enormous economic valleys that separate them. For Florida, the fundamental unit of analysis is the city (or mega-region). These determine where power and influence will flow. Importantly, mega-regions cannot be constructed overnight – indeed there is a powerful self-reinforcing mechanism at work. Mega-regions attract talent from around the world, both further increasing their status and starving smaller cities and regions of the key resource – social capital – they need to grow. Individuals are important – but only in so far as they cluster. Countries are important too – in the Friedman sense that they create a generally favourable atmosphere – but they are not critical to the equation. Divided: Barnett sees a divided world. One on the one side is the Functioning Core, characterized by economic interdependence and incentives to abide by rules, one the other is the Non-Integrated Gap characterized by unstable leadership and absence of international trade and weaker incentives to abide by international rule sets. Barnett’s primary unit of analysis is the state. He is principally concerned with the impact of globalization (and the rule-sets it creates) on state actors – how it constrains them and incents them to behave certain ways. In this world citizens are influence, but it is connectivity, largely (but hardly completely) determined by the state that matters most. Convince a state to connect with the world, and it’s path towards free market democracy (or some close variant) is predetermined. I had so much fun mashing up the Firefox download map with Barnett’s map (and had an incredible response) I thought I’d try to do the same again but with these three authors. Below is a Flat World, overlaid with Spiky depiction of where the most innovation (patents) occurs, overlaid with Barnett’s division between the Function Core and the Non-Integrated Gap. Hoping to write more about these three views of the world over the coming weeks. I’m willing to bet almost anything that Florida’s maps follow a power law distribution. And the above description – well in Florida’s map there are valleys of non-innovation and non-connectivity within Barnett’s Core. The question is: Can the Mega-Regions assert enough control over these values to ensure their rule-sets are followed? This entry was posted in public policy and tagged creative class, creative economy, friedman, globalization, innovation, International Affairs, International-Relations, map, Pentagon's New Map, public policy, richard florida, Thomas Barnett on November 17, 2008 by David Eaves. Fascinating conversation tonight. Was talking to a professor of International Relations from Los Angelos and she was talking about how her new students simply share fewer and fewer “reference” points with her. My undergrad degree is in history and my Master’s had a strong emphasis on the subject so don’t hear me saying history is bunk. It matters profoundly. But people often resort to a shorthand starting point to explain and give context to their world. I suspect that for those of my generation – those born in the 70’s, this date was 1945. Yes, events preceding this date are important, but World War 2 and its aftermath re-organized and shaped the world I grew up in. The international system, the Cold-War, the baby boom, the consumer society, many of these things spring from or arose after, this date. All the more striking is that these institutions and the culture that shaped them emphasized centralization and oversight. The World Bank, the UN, television, everything had strong hierarchical frame to it. It is as if the ethos was: we are going to bring order to the chaos that is our planet and culture. And who could blame them? After two world wars and the arrival of nuclear weapons, I’d probably want emphasize control too. The interesting piece is, I think we’ve crossed a threshold. I don’t think teenagers today see 1945 as the starting point of their history. They live in a world of emergence and networks that probably feels completely divorced from the culture, institutions and technologies of 1945. I’m not sure when young people see “their” world’s history beginning, but I’m willing to bet that it is some other date, maybe earlier, but more likely later. They may not have yet seized upon a date or the triggering event as it may not, as yet, have passed into history. Maybe it will be the year the internet pierced popular culture? Or the day netscape was released? Or perhap 9/11. I doubt it will be any of these. But regardless of the date, I suspect that those born in the 80’s onwards are going to have a vastly different view of history than those born in the 60’s and before – and they are going to re-interpurt the 19th and 20th century in fundamentally different way – possibly in a manner that emphasizes interconnectedness and emergence. For now however, expressing that new sense of history is going to be difficult. Young people remain trapped in a world where the dominant historians, experts and academics – and consequently the underlying narrative – is that of 1945. Personally, I can’t wait for the narrative to shift. This entry was posted in free culture and tagged 1945, free culture, history, International-Relations, internet, world war 2 on September 9, 2008 by David Eaves. So with the help of my very cool friend Jeremy V. we’ve remixed the Firefox download map. The official download map shows us the absolute number of downloads per country. From a marketing perspective this was a great idea. 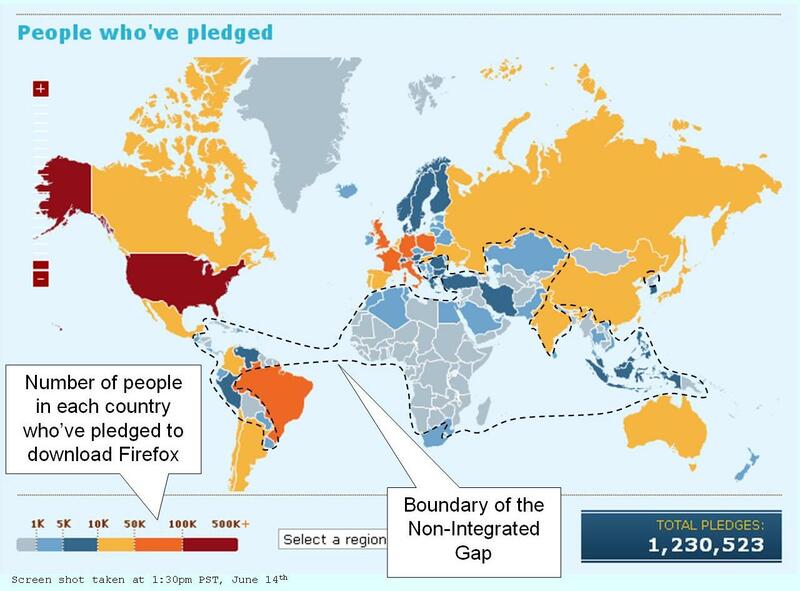 However, since writing the post in which I mashed up the Pentagon’s New Map with the Firefox pledge map I’ve been wondering if their is a correlation between the number of pledges/downloads of Firefox and how “connected” a country is. To find out, we’ve recreated the Mozilla download map but changed the variables. Using population census and internet user stats from Wikipedia. Lots to dive into here. Most notable is how India and China’s strong showing in the initial download map is obviously nothing more than a function of their sheer size. In the later two maps they do not fare as well. The fact that other browsers dominate the marketplace in these countries may also play a role. This is certainly the case in China (though I’m less certain about India). Either way though Firefox’s presence in China and India is a lot weaker than the download map suggests. What, if anything, can be done about this is worth debating. The biggest surprise has to be Iran. It would appear that Iran is anything but the insular isolated country the western media likes to portray it as. Indeed, outside of the western world Iran has one of the highest download rates per capita. This would suggest Iran is quite well connected (and, I suspect, deeply mistrustful of MicroSoft). This should pose a challenge to Barnett’s thesis, in which connectedness should make a country safer to the international system. John Harris who wrote an excellent critique of Barnett’s thesis, would argue that Iran isn’t perceived as a threat because it is disconnected (it clearly is connected). Instead, what makes it a threat is that a ruling elite strives (however unsuccessfully) to keep it as disconnected from the rest of the world as possible. This creates tensions and challenges that exasperate the complex challenge that is Iran. One of the most interesting impacts of open source software is that it may help countries – especially those transitioning into modern economies – increase their connectiveness. These maps seem to confirm this hypothesis. A scan of the % of the population that downloaded Firefox shows a robust number of people in emerging economies – especially in Latin America, Eastern Europe and to a lesser degree, South East Asia. Indeed, the government’s of many Central and Eastern Europe countries have mandated that their public services use open source solutions where ever possible. With many countries in the region counting download rates at over 2% of the population(!!!!) Eastern and Central Europe really is emerging as a dominant market place for Open Source solutions. 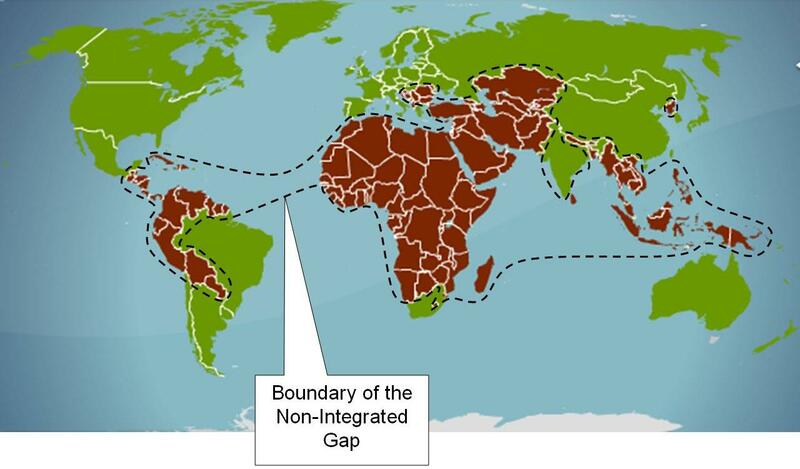 Ultimately, what is notable is that Core countries do by and large well, Gap countries do poorly and countries that sit around much of the perimeter of Barnett’s line separating the “gap from “the core” score in between. For example, the deep pits of disconnectedness are focused around the Stans and Africa, broken up only by Iran and Israel. Consequently, in my opinion the the Firefox download map gives us data that validate Barnett’s thesis. The bigger question is what can open source generally, and Firefox specifically, do to help change the map? 2. I apologize that data for some countries (like Iceland) is not available on this map. Recreating the map wasn’t easy, and it was all in our (and really Jeremy’s) spare time so we did the best we could. 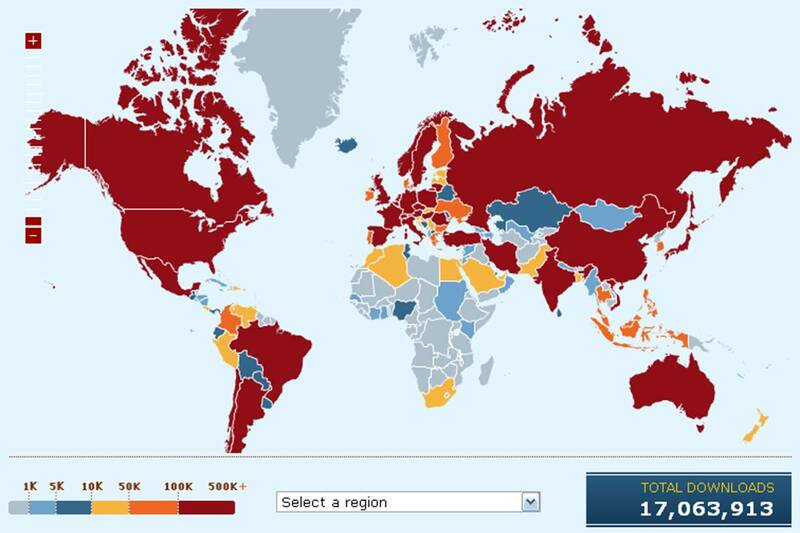 This entry was posted in free culture, open source, technology and tagged digital divide, firefox, free culture, International Affairs, International-Relations, mozilla, open source, Pentagon's New Map, spread firefox, technology, Thomas Barnett on June 22, 2008 by David Eaves. For those interested in Liberal Interventionists and foreign policy I just finished reading a piece by one of the sharpest minds I know, my friend Mike Morgan. Entitled, Michael Ignatieff: Idealism and the Challenge of the “Lesser Evil” and published in the Canadian Institute of International Affairs‘ “International Journal” it is a must read for anyone interested in understanding the intellectual origins of Ignatieff’s liberal interventionist thinking. Indeed, this paper is so good it was awarded the Gelber Prize, given to the best article by a junior scholar in the International Journal. A quick thank you to the CIIA (which was also very engaged and supportive when Canada25 released From Middle to Model Power) for letting me post Michael’s article on my webpage. This entry was posted in canadian foreign policy, cool links, interesting people, liberal party of canada, public policy and tagged canadian foreign policy, CIIA, cool links, Gelber Prize, Helsinki Final Act, Ignatieff, interesting people, International Journal, International-Relations, liberal party of canada, public policy on January 25, 2007 by David Eaves.